A wedding will probably be the biggest and most involved party either of you have ever put together, but don't be scared! You can start planning your wedding in ten simple steps. Kiss each other a thousand times. Jump up and down saying, "We're engaged!" Stare at the engagement ring. 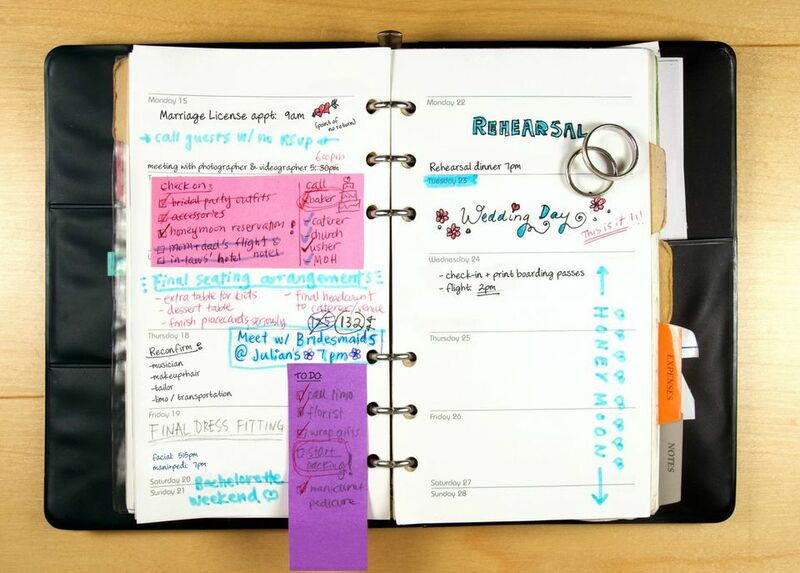 Take the time to write down in detail how you got engaged. Contemplate the wonderful things ahead of you. Take pictures of yourselves with the engagement ring. Kiss each other a thousand more times. Bask in the moment and make your engagement special. You should tell your parents of your impending nuptials before anyone else. (Unless of course, you are estranged.) Both of you should be present and ideally, you will tell them in person so they'll have a chance to see your happiness up close, look at the ring, and start talking about the wedding. Traditionally the bride's parents know before the groom's do, but any order is really fine. (If you're a traditional couple, the groom may already have asked the bride's parents for her hand in marriage.) Then share the news with a few close friends—the ones who are likely candidates for maid/matron of honor and best man, or definite attendants in some capacity. This will be a time of ten thousand moments you won't want to forget, as well as some frustrating times that you'll need to vent about, and not necessarily to your partner. The journal/planner you keep while planning your wedding will not only help you through this time, but it will be something you cherish for the rest of your life. If you're internet-savvy, consider doing some journaling online or starting a wedding blog. Tell everyone the good news! There are many ways of doing this, and no way is more proper or better than any other. Consider announcing your engagement in print publications or mailing announcements to your family and friends. Now would also be a great time to create a wedding website. One of the most important decisions you will make as you plan your wedding is picking a wedding date. Not only will it be the first question everyone will ask you, but you'd be surprised how difficult it will be to make any progress on planning your wedding without knowing the date. This is the time to decide if you're having a formal wedding, a casual affair, or a theme wedding. It's also the time to decide if you're having a religious or secular ceremony. In short, you need to decide what you want your wedding to feel like. A good way to begin is to sit down with your partner and do some free writing about your ideal wedding. Look at the adjectives that each of you wrote and use those as a starting point. I have a newly engaged wedding planning questionnaire to help get you started. Start off by finding a wedding budget worksheet. Look at your finances and figure out how much you already have in savings, and how much you can save each month. Talk to each of your parents and ask them if they'd like to contribute to your wedding. Find out how much they'd like to give you, or what specific things they'd like to pay for. Lastly, decide how much you feel comfortable going into debt. We strongly advise couples to avoid debt as much as possible. Since married couples fight about money more than anything else, why start your marriage with debt on your backs? 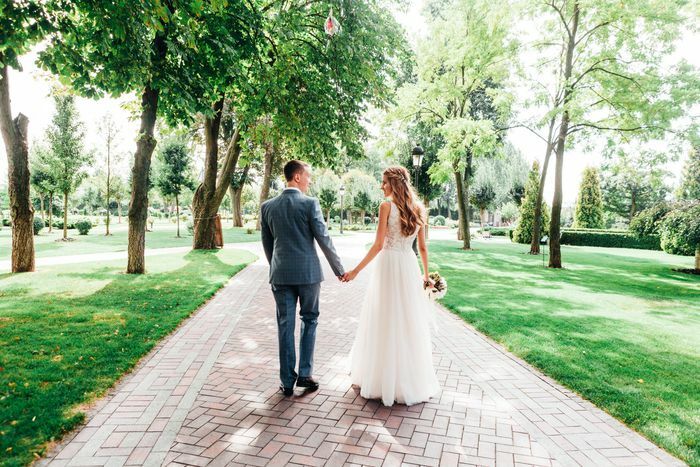 At the same time, you may consider opening a new credit card just for the wedding that will earn you airline miles, cash back, or other incentives. It's a good way for you to keep track of wedding expenses and can help you pay for your honeymoon. Just try to pay it off in full each month. Your attendants do a lot more than just standing next to you on the day of the wedding. Now is the time to get them involved. While some couples opt not to have any attendants at all, especially if they're having a casual event, most choose between 2 and 12 members of the bridal party. Look over these lists of responsibilities for bridesmaids and groomsmen before you make your final choices. If they live nearby, it's nice to ask someone in person, but a phone call is fine for those who live far away. Many venues are booked a year in advance, so the further in advance you start looking, the more likely you are to get the time, date, and cost that you've planned for. The successful bride and groom do not plan their wedding alone—they get help! This may be from professionals, respected publications, online app resources, or trusted friends who've planned their own weddings. Consider hiring a wedding planner or consultant. Especially if you are a busy person, or just feel a little lost, a professional can be invaluable in putting together your ideal day and can often save you money. Use online checklists. They're free, and especially helpful if you're planning with your mother or future spouse in another state. They'll help you stay on top of all of your important to-dos. If you're like most couples, you'll come home from the bookstore with a few thousand pounds of wedding magazines—why not throw in a wedding planning book as well? Now that you've made these decisions, you have a solid foundation for your wedding! It's now time for the fun stuff, like dresses, tuxes, flowers, music, favors and more! Remember to use a checklist to stay organized and on top of it all.